90 Day Challenge: Day 2 | Kay Rice, M.Ed. 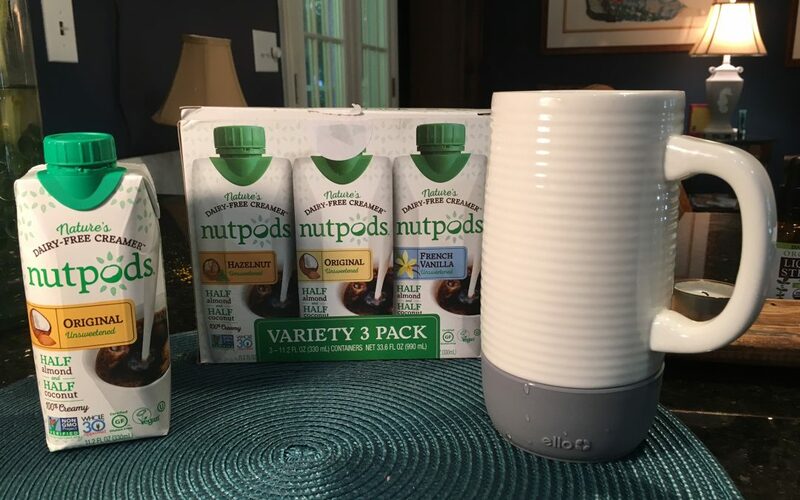 Thanks to Nutpods, which arrived yesterday in my Amazon Prime order, my morning coffee ritual was quite a bit better this morning. 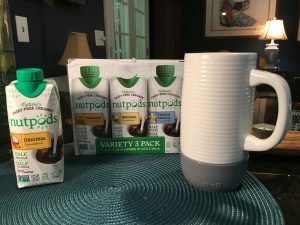 The Nutpod version I triedm orning was the “original” flavor. I was delighted to see that my coffee turned the beautiful tan that I am used to, and I don’t know if it was just the color that made it better, but I actually do believe the flavor was much better, too—I still missed the sweetness from the honey, but I can live with this! I’m excited to try the Vanilla flavor Nutpod tomorrow. The third flavor is Hazelnut, which I suspect I may actually like better than the sweetened flavored versions, which generally are too sweet for my liking. This was what was in my Breakfast Bowl this morning. This is one of my favorite breakfasts because I only have to fix it once and I have enough for 4 meals. Sometimes I change up the ingredients to include different vegetables. On the 90 Day Challenge I will likely add some hash browns to the recipe so it is a complete meal in one serving. Sometimes I just stick with the spinach, onions and peppers so I can add a serving of carbohydrate on the side. I’ll post a recipe for this one because it is a good one to have. Sometimes I have Frittata for lunch or dinner. 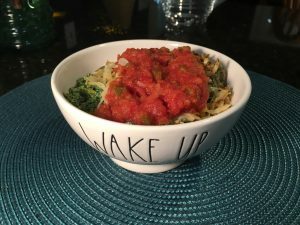 I made this a few days ago and this was my last serving so I’ll be making a new batch soon. While I was having breakfast I boiled some eggs to have on hand. They can be grabbed to take on the go, or for part of a meal in a hurry. 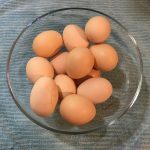 I like eggs, they are high quality protein and inexpensive per serving, even when I use 1 whole egg and 3 egg whites for a serving of protein & fat, it is still inexpensive compared to other options. My eggs from the farm cost $2/dozen, so that is just 50 cents per serving. It all evens out though. Lunchtime rolled around before I knew it. Suddenly I realized it was time to eat and I was hungry. This is where preparation in advance pays off. 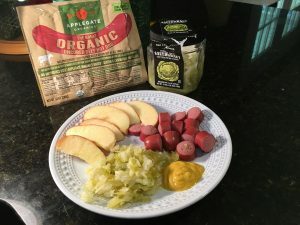 I went to the kitchen and grabbed two Applegate’s “Great Organic Uncured Beef Hot Dogs” made with 100% pure grass fed pasture raised beef. I heated them in a skillet in bite size pieces. Add some Sauerkraut & mustard and some apple slices to my plate and I had a delicious meal in less than five minutes. Until I found these hot dogs, I hadn’t eaten a hot dog in years … you’ve probably heard what goes in SOME hot dogs. These have no nitrates or nitrites added except for those naturally occurring in sea salt & celery powder, no antibiotics, gluten & casein free, no fillers and no sugar. I got both the hot dogs and the Sauerkraut (which is delicious, by the way) from the refrigerated section at Trader Joe’s. Those will definitely be going on my next Trader Joe’s list, again! It’s been extremely hot for a couple of weeks, but today it was fabulous. Definitely “porch sitting” weather. For dinner I used the second serving of the seared scallops from last night. I paired them with some mixed greens and a chopped tomato, tossed with some of Primal Kitchen’s Chipotle Lime Mayo. I used a tiny bit of the mayo for a sauce for the scallops, too. WOW! That mayonnaise is delicious! Loved it! It’s made with avocado oil and everything organic. 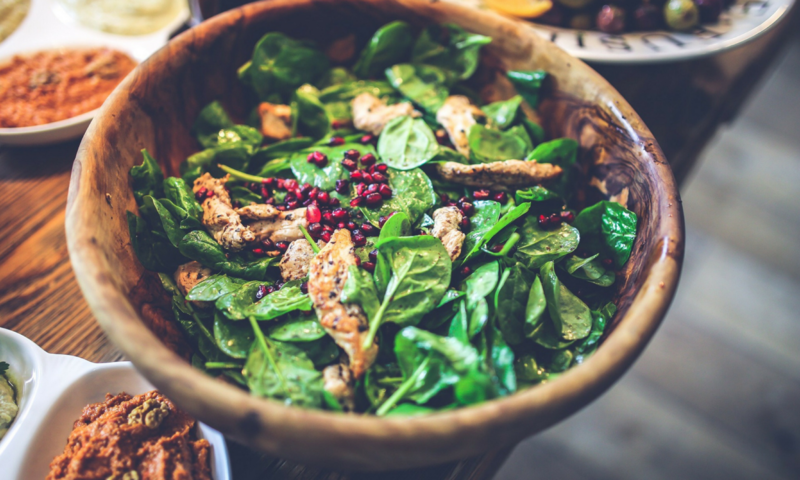 Tip: I tossed the mayonnaise with my mixed greens and tomato in a separate bowl. The mayo mixed with the tomato juices and a little bit went a lot further that way. To finish off my dinner, I had half a Kombucha! Well, honestly I ended up swapping it out for a regular lime soda water. The kombucha flavor didn’t really pair well with the spicy sauce, so I enjoyed it after dinner. 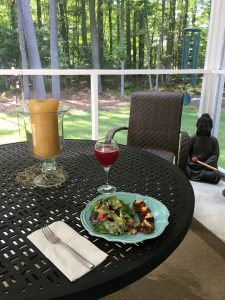 Last Meal of the Day: Self-Care & Indulgence—No Deprivation Here! Honestly when it was time for me to eat the last meal for the day I wasn’t all that hungry for a big bulky meal. 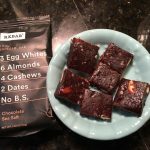 I kind of like this meal to be a little bit lighter, so I grabbed one of the new RX Bars to try. They get their protein from egg whites and their sweetness from dates. This looks like an itty bitty plate. It had some dense calories, but not too many. I had that and a cup of herbal tea. As I tasted the first delicious bite I found myself thinking, “How can I possibly feel deprived! I’m getting to try all of these delicious new foods!” That’s what I like, to try new things, and especially healthy new things! Exercise is still very limited while my knee heals. Heck, walking is still hard; walking fast isn’t an option. I did make certain I got up and walked some each hour, and I did some stretching. Remembering this challenge is about extreme self-care and making myself and my health a priority over the next 90 Days—I made an appointment for a deep tissue massage on Friday afternoon. I took my liquid multi, and I have a confession. I re-read the label and there is a sugar alcohol in the “other” ingredients. After pondering it I’ve decided that I’m going to keep taking it. I think I would be hard pressed to find a liquid vitamin without any sweetener, and I really do like the colloidal minerals in this brand. I do believe the increased absorption that I get from a liquid muti-vitamin as opposed to a tablet is worth it. Water … I barely made my target, but I made it! I drank two of my 28 ounce Mason Jars of spring water; to make my target I had to count 8 ounces of Kombucha and 24 ounces of soda water. Total: 86 ounces – actually, over goal. Sign up for my Updates & Get access to my Nutriton Challenge Fast Start Strategy Guide. You'll receive my updates, new recipes, healthy lifestyle tips and motivation. Just one more step. Please go to your email In-Box and confirm your subscription!